I can remember my daughters very first Symphony. A family friend had given her and several others a ticket to go to this special event. She was about 16, and so excited. She had long wanted to go, and at last the opportunity arose. She was so unsure what to wear, but wanted to look her best. 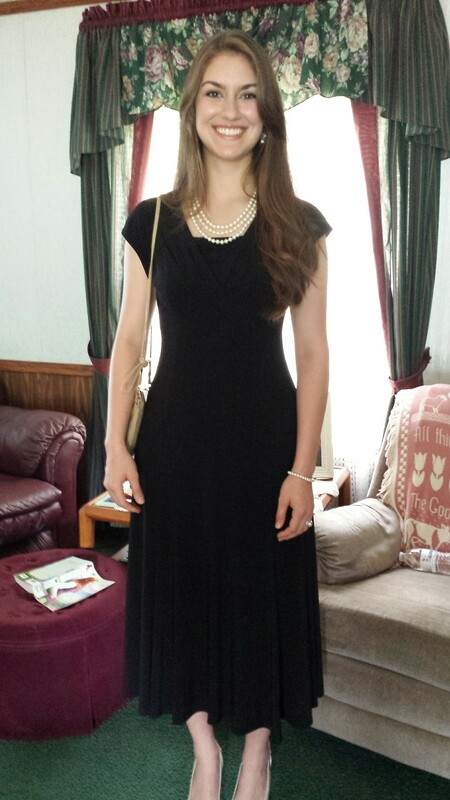 So she decided on a black dress accented with white pearls. She was just glowing. She has played the fiddle ever since she was 5, and even before played some on it. So the interest of hearing a Symphony with all the different instruments had been around for a long time. When she got home she was telling her dad and I all about the conductor and the different pieces of music they played. There was many different instruments, and she was amazed with it all. Then she went on to say, when they got to the Symphony all the girl assistants or workers to her surprise were also dressed in nice black dresses. When they were handing out programs they were unsure whether to give her one or not. Politely, she smiled and took one. She won’t be wearing her black dress again, but did really look beautiful. What a blessing it is when the Lord puts it on someones heart to give in a special way. That was special to Charlotte. It will be a time in her life she will always remember. She is very Beautiful and I wish I could hear play the fiddle!! God Bless Ye All Sisters and Brothers in Christ Jesus-Yeshua and Your Families and Friends!! Thank you so much. God has surely blessed! Previous Previous post: PRAISE GOD For HIS TRUTH!